Please accept my sincere apologizes if my email message does not meet your business or personal ethics, I really like to have a good relationship with you, and I have a special reason why I decided to contact you because of the urgency of this matter. I am Miss. 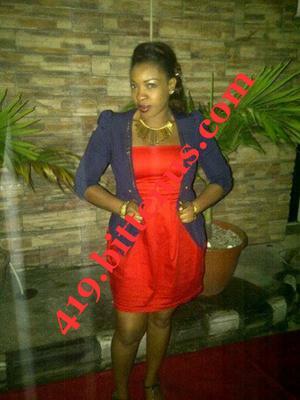 Christy 30 years old single female working as a banker here my country; I am presently in Cote d'Ivoire. Thanks very much for your message. I want to get everything very clear. This transaction is not illegal and cannot get you or any person into trouble. In capital letters, I ASSURE YOU THAT YOU SHOULD NOT BE WORRIED. I will always be very sincere with you in this transaction. The bank has some ways of sending or transferring these funds to you. 1. Bank to bank swift transfer. In this process, some documents is required and will cost both of us some money but not so big. As the bank will use their legal lawyer who will then go to the ministry offices here and pay in the money on your behalf before they will now issue him all those legal documents which must bear on your name before the bank will now have official power to make these funds transfer to your account without any delay or problem. 2. ATM Visa or Master Card. With this system, the money is loaded into any of the cards and it is drawn from the card in bits according to the limits of the country in this case, many documents are not required which will still cost some money. Meaning that the bank will issue a new master card on your name and then load the funds into the card before posting it to you through DHL to your postal address. Now I want you to send your full details information's for me to be use and do the bank computer programming in your name as the beneficiary to these funds, been who will receive the funds into his account, I want you to send a copy of your passport copy or id card as I will need it to do that programming here in the bank computer file system, just to make sure that everything works out very fine. Before given you these details I have gone to visit Madam in prison been the owner of this said funds we are talking about, the wife of our formal president Mrs. Simon Gbagbo who is now in jail because of political problem in our country as they did change of new government. Do you know that all their family money both her money and her husband money the new government have taken them, But thank God that they did not know anything about these funds in question and the government did not see it because of the way she deposited the money, even the husband who was the president then and he is also in jail at the international criminal court been ICC in Netherlands. All their money they kept here the new Government have taken them it is now remaining only this sum been this $9.5 million us dollars, that is why she asked me to look for a foreign person so that the bank will make this funds transfer to your account and after the transaction you will take 30% of the total money, while the rest of the funds you will be the one that will help us to invest money in your country in a very good and profitable investment in your country, but that will be when I will then come over to your country and meet you after the bank finish making the funds transfer to you, as I must be here to make sure that I monitor up everything to avoid delay in this matter ok.
After meeting Madam today in jail to tell her about you, she was very happy with this development also she said that I should please tell you to speed up in this process so that this money will be move out from here before the coming week finish to avoid the new government not to see the funds. That it is the only thing that is left for her and her family, so she also said that you should not tell anyone about this transaction that you should keep everything as top secret to avoid any government official or anyone to know about this her funds. My dear without much delay I have attached my passport copy with my pictures and the deposit document so that you will be sure of everything we are doing. You should send me all your full information's now as listed below so that I can start making this bank computer programming here, after doing that I will then send to you a copy of bank application form to you which you will fill up and then use the two bank emails address that is inside the form and send it to the bank for them to approve the transaction and then tell you what next you have to do without any delay. It will be the bank that will tell you what next you have to do by the time they will approve these funds transaction on your name which the transaction will not take much days highest within the next four banking days they will finish every process provided you follow up with all the bank instructions, like as I told you that there must be some legal documents the bank must surely ask you to pay for so that the bank legal lawyer will be the one who will get all those legal documents from the ministry offices here on your name before the bank will now have official and legal power to make the funds transfer to you. Understand that without those legal documents there is no way the bank can have any power to make these funds transfer to you as the 9.5 million us dollars we are talking about are still in a fixed suspense account which the bank must first activate the account were these funds is now with the help of those legal documents, and also note that those legal documents will be issue on your name which are the thing that will back up the funds to your country without any one asking you question both your bank and your country government as the funds are to be use for investment over there in your country or anywhere in another country depending on the country you feel that we can invest the funds. Please you have to make sure that you follow up in this matter and speed up as we want these funds to be transfer to you before this coming week finish as the bank will not take much time to complete up the whole process, highest within the next four banking days from now if you follow it up the funds will be into your account or by ATM VISA CARD without any delay or problem. Please note that this will cost you some money but not a big amount of money, from the information's I got here as the money you will pay, the lawyer will use it and go to the ministry offices and pay in the whole money, then they will issue all those legal documents that will be on name, after getting it he will take them to the bank and also send some copies to you, as the bank will now use the approval and authorization from those legal documents issued from ministry offices to activate the account were these funds has been for years which is now dormant before they will now make the transfer to you. That is the main reason why I contacted you, as I have spent some money which I have been saving since just to make sure that everything about this funds transaction works out very well, THEN I BEEN MONITORING and programming everything regarding these funds which I will still spend some amount of money by the time you will send me all your information's just to make sure that I program all your information's as the beneficiary / the person who will receive the funds over there in your country. Then the only money you will spend in this matter is the documentation fee like as I told you that is the only thing the bank will ask you to pay for, and based on what the madam told me today when I visited her in jail she said that I should explain everything to your full understanding how everything will work out, as she will not be happy after when the bank approve this transaction on your name there will be delay or you will make the bank to cancel up the approval as a result of not meeting up in getting all those legal documents everything will be delaying which will not be good. She is pleading because of her condition as she will not be happy if the government see this her only remaining family money, that is why you have to work very well and follow up with all the bank instructions without any delay both in getting all those legal documents so that the bank will make the transfer at once without any delay. she also said that I should explain to you very well regarding how everything will work out and all the steps we have to follow and what you have to spend, and that is why she is given you that 30% of the total funds for all the whole efforts and expenses you will make in this transaction, by the time you will send your details information's after programming it I will send you the copy of the bank form you will fill up and send to the bank email for approval. Send a copy of your Identity card or international passport copy as I will need it to complete up the bank computer file programming here. I wait to read from you soon and keep this information top secret. See the information's I needed from you now. You are very funny in your message as you are remembering me what is happening here been the civil wars and terrorism. My dear it is true and that is what Is going on over here every day by day which I don't know why and also because of the bad government here, they are also the once causing all those problem here. That is why I am working so much making everything possible to see that this my madam funds will be transfer out from here to your country and into your account without any problem or delay then I will start coming over there to meet you and start up a better life there, and I am happy that you can as well invest this money over there in your country once the funds gets into there. I am still single which I am praying that after this transaction both of us will get marry as one and I am promising you that I must be making you happy all the time in your life. Here we have a strong tradition as every woman must respect her husband all the time which I must also do that for you as well. Dear now the information you have sent to me is correct I will first go and meet madam at the prison where she is as she is the owner of the said funds and she was the one that asked, me to look for someone who is good that can help her to make sure that the bank transfer this her only remaining funds out from this country, to avoid the new government here not to claim up the funds as they have taken all their funds is only this one that is remaining. After meeting here I will then go to make the bank computer file programming with all your information which I myself must pay some money online now to make sure that I program all your details information's in the bank files system as the beneficiary to this funds and who will receive the funds into his account. Once I finish doing that I will then send you a copy of the bank application form that you will fill up and then send to the bank email for approval. This is how everything will work out and this transaction will only take us about four good banking days for the bank and their bank lawyer to complete up everything, as there are some legal documents the bank must surely direct you on how you will get them here through the help of the bank lawyer, as those legal documents are the thing that will give the bank official legal power to make the transfer to you so that nobody will not question you concerning the funds. Please make sure that you keep this transaction top secret do not in any way tell anyone about this transaction until we finish up then I will start coming over there to meet you in your country. I will soon send you the application form once I finish making the bank computer programming of your information's. I am just coming back now from the prison where I went to visit madam been the owner of these said funds, to explain everything to her before I will then make the bank computer file programming with your information's. Getting there I saw madam and she came out, I have to tell her everything because she was the one that asked me to look for someone I know that I have trust in and someone who is in another country, as she wanted this her funds to be transfer out and which will be use for a better investment over there in your country or Saudi Arabia depending the type of investment you will invest the money into it. Note that you are my heart forever and you are Gods sent to my life which I am very happy to have you in all my whole life, and please my love try and call me now on phone too so that we can talk more. I showed her your information sent to me, madam was very happy about all your efforts and the trust, But she also said that once this her funds is been transfer to you that the first thing you will do before I will come over there to meet you, is that you should take out some reasonable amount of money from the total funds and start looking for a better thing or profitable investment there in your country we can invest the funds into. She said no problem that I should go ahead and pay to program all your information's in the bank file as the person who will receive the funds into his account / beneficiary and the reason for transferring the funds is for investment ok which I have done as well. Then she also said that I should explain to you regarding this transaction that you should make everything possible to follow up in this transaction and speed up with it so that there will be no delay on the line, she also said that I should inform you to try everything possible to see that you make sure that we finish up this transaction before coming week finish as this will not take much time. Madam also talked about all those legal documents the bank must surely ask you to pay for through the bank lawyer here, that you should also try your best and see that you do everything to see that you send the money to the lawyer for him to use it and go to start getting all those legal documents which will be on your name and is the only thing that will give the bank official legal backing to make the transfer to you, but that will be after when the bank finish approving the transaction on your name and those legal documents is very important, because without it there is no way the bank will have any power to make these funds transfer to you, but once the lawyer gets all those legal documents which must be on your name the bank will have full power to transfer the funds to you without any one both here, and your country government they will not ask you any question concerning it as all those legal documents will back up the funds to your account. Also once the lawyer gets all those legal documents on your name and then the lawyer will send all the copies of those legal documents which he got on your name to the bank been the original copies which after the transfer the bank will post all the original documents to you by DHL post as well to your postal address. My dear try your best as I have all my hope, trust, understanding and full love in you. I will send you the copy of the bank form now so that you will fill it up and then send it to the both bank emails, and I have already finished paying and programming all your information's now here in the bank file as the beneficiary to this funds everything went normal there is no more problem again to it. You should try and make everything possible to see that you follow up with all the bank instructions without any delay, I will send you a copy of the bank form now so that you will fill it up and then send to the bank email for approval on your behalf then the bank will tell you what next you have to do ok. 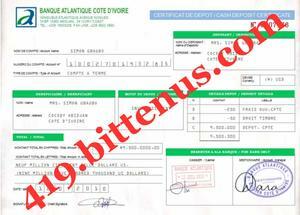 APPLICATION FORM FOR CLAIM OF MY ASSOCIATE'S FUNDS OF 9.5 MILLION US DOLLARS (MRS. SIMONE GBAGBO) DEPOSITED IN YOUR BANK AS SHE INSTRUCTED ME TO CONTACT THE BANK NOW. I want you to tell me the requirements requesting for the funds to be release to me and I strongly believe that my application will meet your urgent and in favorable consideration. Subject: Re: FUNDS APPROVAL FROM ATLANTIC BANK-CI./TO Mr. .
COMPLEMENT OF THE DAY, Mr. .
RE, YOUR APPLICATION OF FUND CLAIM FILE 00720087X1, SUM NINE MILLION FIVE HUNDRED THOUSAND UNITED STATES DOLLARS ONLY .($9.5). We acknowledge receipt of your mail dated to my attention, July 3rd, 2016 with regard to the above referenced fund file. As have Instruction on the fund file with Mrs. Simon Gbabgo who happened to be the fixed fund depositor here in our bank. I have gone through your application and the program in our computer files, and we saw all these information from you is correct. 9. Your bank account number. And we also need a copy of your passport which we will use to complete up the funds transaction process. Then you will need legalization and normalization of the transaction as Stipulated by the law of our country Cote d' Ivoire. By this method, the beneficiary will need to legalize his claim of the Funds at the ministry of justice of the Republic of Cote D'Ivoire which will authorize the bank to effect the transfer. 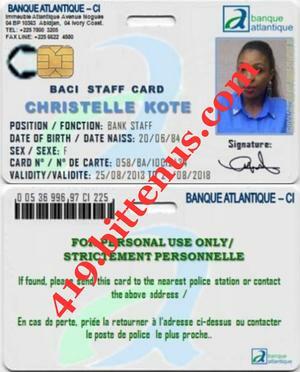 The beneficiary been you will also get the necessary approval documents that will be required from the ministry of finance and BCEAO that is our central bank (Federal Republic of Cote D' Ivoire) to enable the bank transfer the funds legally into your designated bank account details. And this will cost you the sum of usd $3,600. GRAND TOTAL = US$ 3,600. The same procedure in number option (1) applies here as well and thereafter, the draft will be couriered to the beneficiary designated address. This is a service reserved for the banks millionaire clients for their Convenience, by this system, the funds, will be electronically programmed in the card and couriered to the beneficiary's designated address. The beneficiary will make a daily withdrawal of a maximum of US$100,000.00 from different ATM MACHINE in your locality until the total amount is completed; the beneficiary can as well buy goods and make payments with the card at companies or institutions where value card or Visa Card or credit card services are applied. And this ATM CARD works in every country all over the world. Kindly read the explanations in this message carefully and get back to us with a copy of any of the government identity , well we have all your bank details but as our country banking rules and regulations we have to explain all the whole process for you to know the type of transfer we do operate here . Sir understands that in all the whole process stated, to be done there are laid down rules/procedures according to banking rules in our country which must be adhered. Then to secure the above documents, you may need to appoint a resident attorney who will represent and assist you in obtaining those documents. Alternatively, you could use the our bank's accredited independent attorney, in which case you will not need to pay him any legal charges for his services, only what you will pay to the our bank attorney is the total cost of getting those legal documents from the ministry offices and he will get all your work done within two days,we will then effect your funds on the third day upon the confirmations of all those documents needed, bear in mind that once the lawyer get all those documents according to the international financial law we will make your funds transfer direct to you without any international funds bodies / your country government stopping your funds until it gets to you as those documents needed are in line with the International Money Laundering Abatement and Anti-Terrorist Financing Act of 2001 as Amended. Therefore you should use our bank's accredited independent attorney for him to get all those documents on your behalf here; you should make all the payment to the lawyer as well. Below is the lawyer contact. Contact the lawyer now and make him to understand that we are the one who directed you to him as he will know what to do by coming up here in our bank to pick up the needed information's from us here. Finally, feel free to call us on telephone number +22578003205 for any clarification you may deem necessary. Please open the attachment to see the approval documents done on your name today. Bank Director /International Remittance Head. Subject: RE, BARRISTER MUSA ESQ COST OF LEGAL DOCUMENTS TO MR. 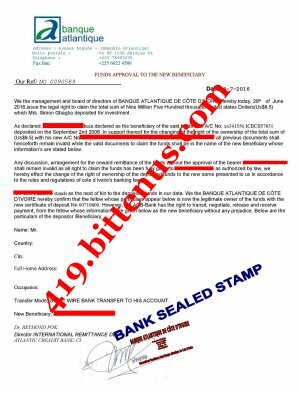 I acknowledge the message you sent in confirmations with the receipt of your information's forwarded to me by Dr. Reymond Pok bank manager of BANQUE ATLANTIQUE DE CÔTE D'IVOIRE, in respect of the above subject matter. Thank you for consulting Dantata Musa Chambers & Solicitor. Please note that the Bank manager of A BANQUE ATLANTIQUE DE CÔTE D'IVOIRE called to inform me that he has recommended me to work for you, in order to get all the necessary legal documents as required by law, for crediting the funds to you. As the bank manager might have briefed you, the basic requirements for such huge transfer according to our probate laws. I have accepted to work for you and to give you the best of legal services with speed, efficiency and accuracy. And as you probably know, getting such very vital documents cannot be obtained free of charge. There are certain basic charges and fees that must be paid at the high Court of Justice ,the Ministry of Justice and ministry of finance where the approvals and authorization documents for transfer will be obtained which is the only money you have to pay regarding to your funds transfer. On this basis therefore please find below, the breakdown of the cost of the Legal services which am sure that the bank manager have informed you as well. Total amount of money needed to use and get all those legal documents here is the sum of US$3,600 (Three Thousand six hundred United States dollars) only. Condition of Payment: You are required to pay only the sum of $3,600. (Three thousand Six hundred United States dollars) only, which covers mainly documentations fee and official payments to be made at those ministries offices for the documents to be issue on your name. 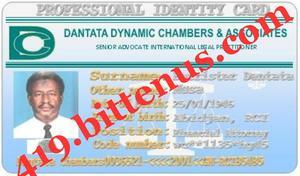 while Our profession service fee which is the money coming to Dantata Musa Chambers & Solicitor, since you was directed from the bank we are their legal Attorney you have no problem regarding that now all that matter is the documentation fee, I will advise you to make sure that you send the fee today to enable us complete up your work, you should not in any way have any fear because we are given you 100% guarantee in all our legal services, and we have been into this works for more than 25 years your money you are sending is 100% guaranteed see my Id card attached for you to be fully sure of who you are dealing with. We promise to get this job completed in not more than two days. Since you were directed by BANK, we are given you the privileged of not collecting professional charges from you; all you need to pay is the fees for the documentation as stated above. You should go ahead and send the US$3,600 (THREE THOUSAND SIX HUNDRED UNITED STATES DOLLARS) ONLY. I advise you to send the money through Western Union Money Transfer or Money gram transfer which is the fastest means of receiving money down here. If you send the money today; I will get it today also. On receipt of the money it will take 24 hrs to get the documents ready. You are to pay the money to my secretary names below. AMOUNT / US$3,600 (THREE THOUSAND SIX HUNDRED UNITED STATES DOLLARS) ONLY. I hope you understand that you will send it through either western union money transfer or Money gram this is the fastest means of sending the fee because of the urgency of this transaction, After sending the money make sure you forward me the transfer copy slip by scanning it to enable us pick up the money down here or you can as well write down the transfer information's and send to my email is also the same. I will start drafting the various applications while I await you to send the money now. Note as an old man with the official power covering my office been my chembers and the bank we all are given you full assurance regarding to your funds transaction that it must be done and complete on time as promised , then the money you are sending must be use to complete up the documentation process and your total funds must be transfer to you within the next two days from now once you send the fee, as I cannot tell you lie since this is what I have been doing for so many people for years with good records. After the work there is some help I will also like you to do for me in your country, my last son will be coming to your country for a kidney operation, which I like you to accommodate him for me is only good help you can do for me since I have known you as a good friend and brother, even I have paid all his medical fee but the doctors asked us to wait until next month. Well we will talk about that later. Once you finish sending the money make sure you email me the transfer information's for me to see the information's on time, been the western union transfer copy slip which will be use and pick up the money down here to complete up your works. I got your message I want you to understand the reason why I asked you to send the money through western union money transfer or money gram they are many there in your country, and once you send it I will my staff will go and pick it up on that same day and bring it for us to start up the documentation process. Why is important for you to use any of those money transfer agents is to avoid the bank here not to cancel your funds approval, because of funds approval made by the bank here after three to four days without the beneficiary starting up the documentation process the central bank here due give the order to cancel up the approval, if you send through bank to bank transfer it will take more than a week before the money will clear here and by that time everything will be late. It is better you try and use either western union or money gram means and send the fee, the charges will not be much as all am fighting is to make sure that I meet up with the time and date. Even the bank manager called me today asking if I have started up the work which I told him know, he said that I should tell you to speed up and your phone line is not going you can give me another of your phone I can be using to call you for easy communication. BANQUE ATLANTIQUE, COTE D IVOIRE. That is our receiving international account but I will still preferred you use either western union or money gram to meet up with the time if you can make the payment even online I will start up the work soon been through western union or money gram.